I attended a school/Church auction over the weekend where the committee asked me to paint a piece of furniture as a donation. Of course I said yes, but that quickly turned to me freaking out trying to find a cute piece. Well I had my sister’s old desk from when she was a kid sitting in my basement begging for a makeover. And since it was a school auction, a kids desk was a perfect fit. 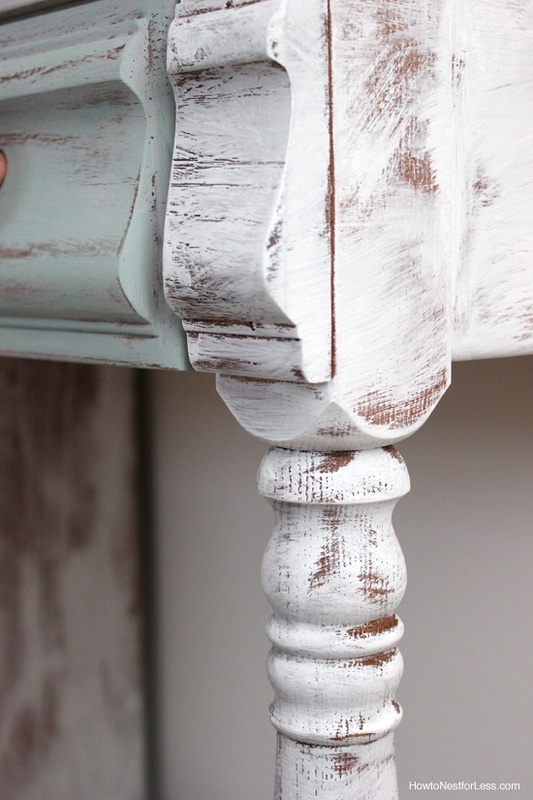 I used Annie Sloan Chalk Paint for this makeover, mostly because it doesn’t require me to do any sanding. 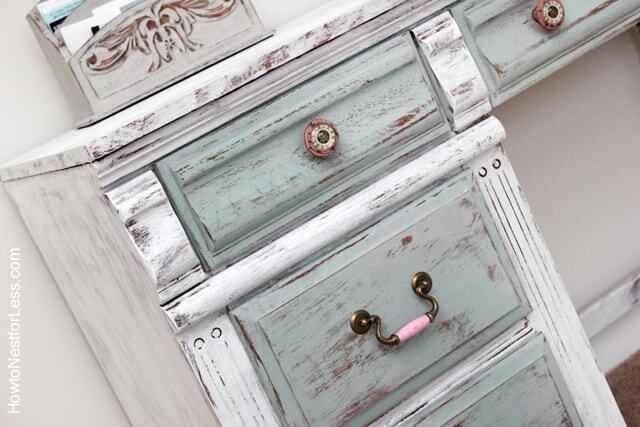 Once I had the base painted in Pure White, I coated the drawers in Paris Gray, then Duck Egg Blue. I purchased some new knobs from Hobby Lobby and painted the old handles pink to match. Then I coated the entire desk in clear wax to give it a bit of durability. 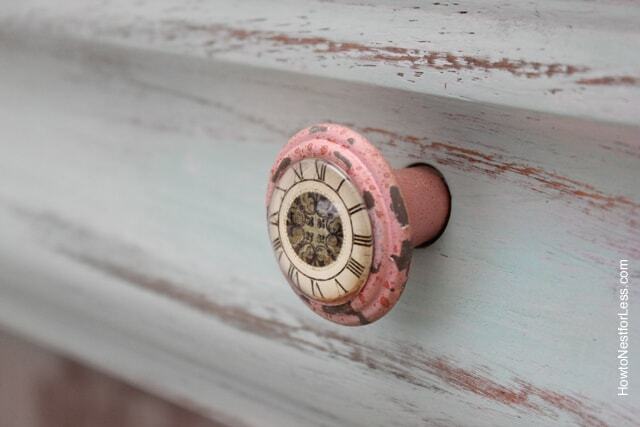 I’m seriously in love with these knobs. Totally go with the distressed paint job. I did use a sanding block for some areas that weren’t quite distressed enough, but overall the dry brush technique was perfect for the look I was trying to achieve. LOVE this. I haven’t tried that technique on a large piece of furniture but now that I see it, I’m inspired. Thanks Kim! I was a little nervous at first, especially with the larger surface areas, but the dry brush effect looks great! Good luck to you. This is lovely. Looks great! I have redone a head board, so I always love to check out projects like these. Wow! I was never a fan of old looking furniture but this looks so sofisticated! And that whole vignette, so pretty! I love the paintings above it too! Hobby Lobby too? Thanks Kim! Paintings are a find from Joss and Main!! I must of missed that one! Love how your desk turned out. It’s really very lovely. 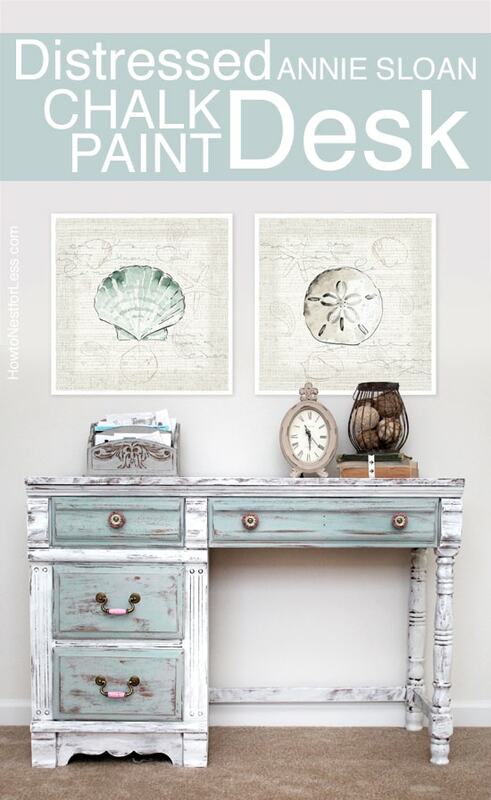 I want to try the chalk paint, but haven’t gotten around to it just yet. The distressing on this is just gorgeous! Great job! Thank you so much Anna! 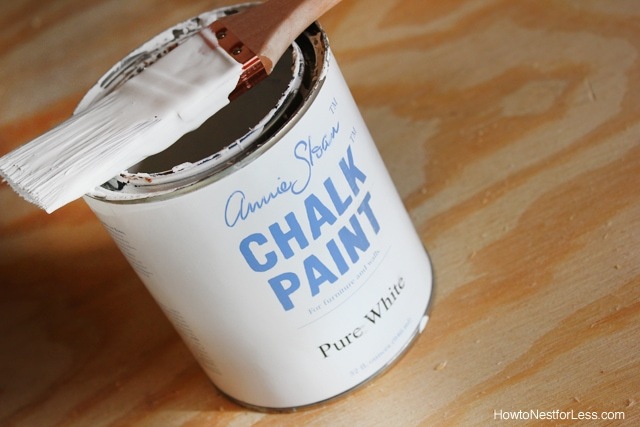 I’m sure you’re going to love chalk paint. It’s addictive! Beautiful Erin! 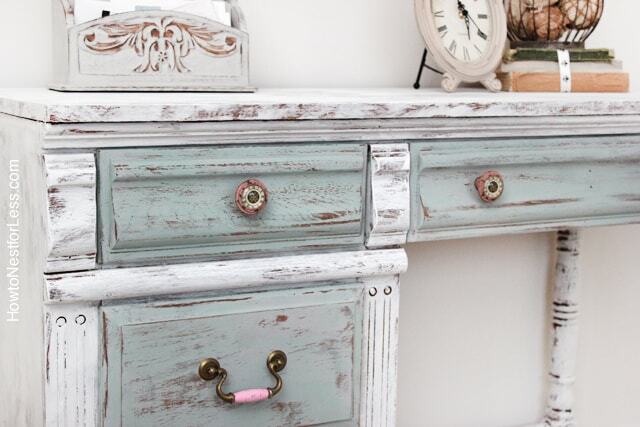 I love how you use the 3 colors to make one amazing piece of furniture! Pinned it! 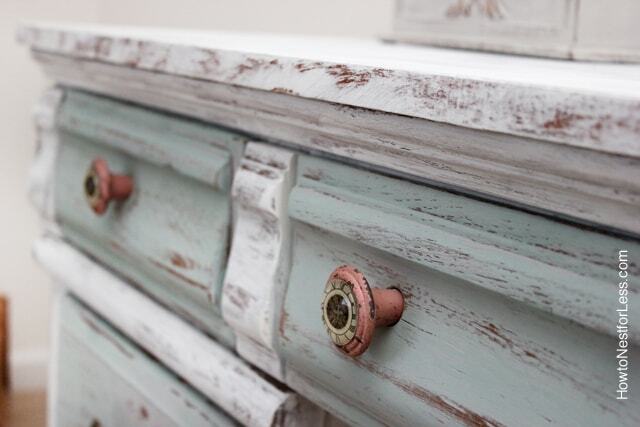 Absolutely love Annie Sloan chalk paint and this is a perfect example to inspire others. What a beautiful job with the dry brush technique. Love everything about it. Wow, it looks so pretty. Love how it turned out. Love it so much and how it popped with the hardware. you pulled this ne off kiddo. Great job! Thanks again. Absolutely love it!!! 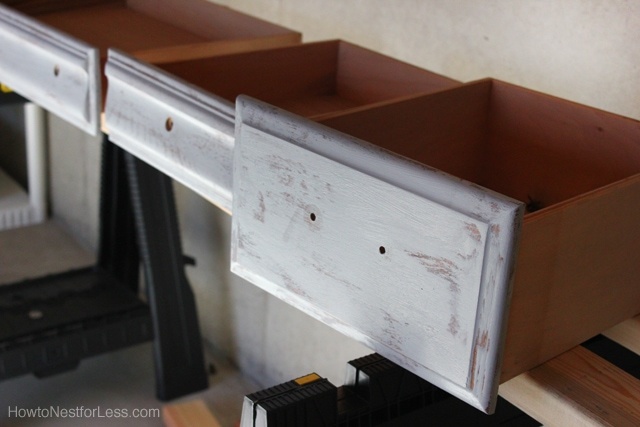 I have a question… I chalk painted a dresser that I will be using for an kitchen island. Would water base poly be better than wax? This is my first time using chalk paint so with all the constant use wasn’t sure if the wax or poly would be better. Thanks so much! Hi Tracy. Yes, you can use a water based poly over chalk paint, but I would definitely test one small area first. 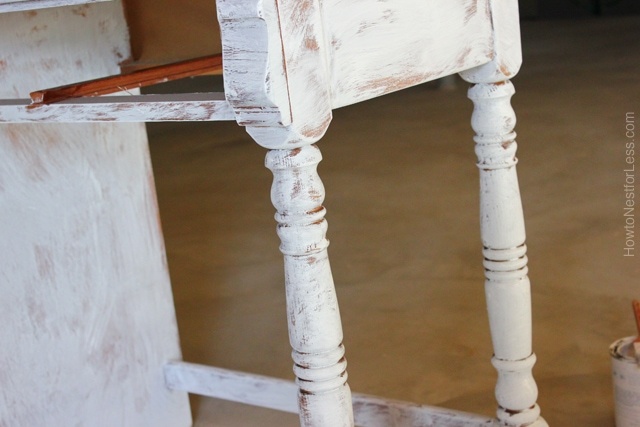 A water based poly can cause your chalk paint to crackle, depending on some pre-finishes. You can also try Varathane Diamond Wood Finish. It dries quickly and is easy to work with! Hope that helps! SERIOUSLY love this! I’m checking around everywhere to see where I can find this paint! I dread sanding, so I think this will be the kicker for me. I love love love it! So Beautiful! You’re very talented! Haha, already sold it actually! Thank you though. Too sweet. what is the color of blue ypu used for the desk. I’ve not tried the chalk paint yet. Going to get some after seeing this! It’s beautiful. I’m a beginner and have a lot to learn but love testing out different types of paint. I was going to try the milk paint but can find it anywhere in my area. They have some of the chalk paint at my Lowes store but I saw on here how to make it with paint, water and I think plaster of Paris. I’m going to give it a try on an old cabinet I bought. I’ve sanded it and painted it two time but I’m still not happy with the color of blue. It’s called Duck Egg Blue. It’s my favorite chalk paint color! Do you need to sand the item first to remove the shine from the previous stain/varnish? Not when using chalk based paints! This desk is awesome and I’m getting ready to do one very similar. I am not a craftsy person at all, let alone a painter, so do you mind explaining to me what you mean by the “dry brush” method? Thanks!! I only get about 1-2 inches of the brush wet with paint. Then I lightly brush the paint over the dresser, using only one direction for the paint strokes. I do two coats with this technique giving it about 1 hour in between coats. At first it will seem REALLY light and sparse, but the second coat evens it out! I’ve inherited my mother’s French Provincial bedroom suite years ago and was ready to give it to an antique store or someone in need. I didn’t want to give it up because of my sentimental attachment, but it didn’t go with anything in my apt. I am going to try doing this DIY on the two end tables first, fingers crossed. I’ve never been a DIY-kinda-gal, so I am a tad nervous. 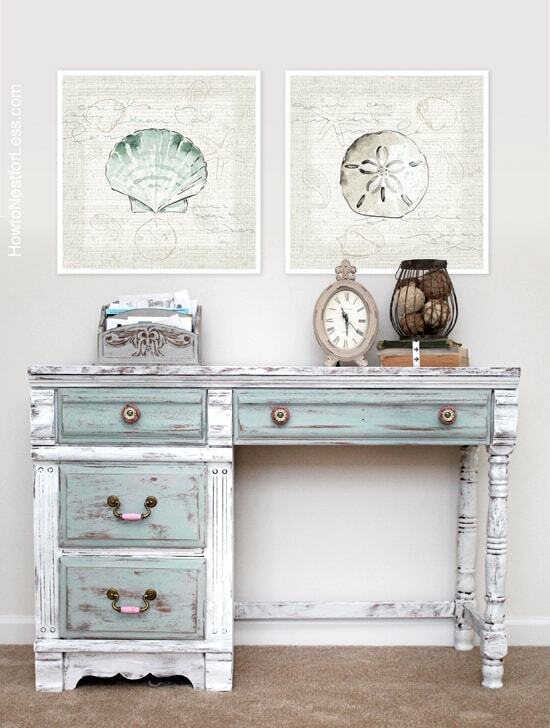 I couldn’t believe it when I was searching for an idea for painting a desk and hutch set. I somehow came across your blog and you not only had pictured your beautiful desk (EXACTLY LIKE MINE) but you provided a tutorial on it to boot! I couldn’t wait to get started. I followed your tutorial and photos. It was fun trying to distress in the same places you did. : ) It didn’t turn out exactly like yours but it turned out GORGEOUS. I had no problem selling this piece – except for the fact I really, really would have loved keeping it. Thank you so much! I just signed up this morning for your newsletter and realized that you are only about 60 miles from me. Small world! 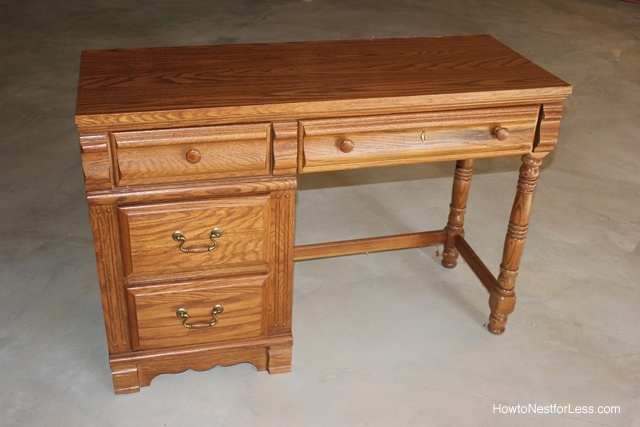 If you get a chance, you might want to read the saga of my hutch/desk combo. For anyone who has struggled storing furniture, you might be able to relate. Wow Sharo! I thought that was my desk at first, haha! Great job!!! I am amazed by your talent. This desk is beautiful! Not that talented myself, but would love to try this. Do you have a video on how to dry brush? Thank you so much! No, I don’t have a video. I’m planning to paint my foyer table with this technique later this month so I’ll try to make one! That looks fabulous. I see a lot of awful-looking pieces online, but you really have an eye for it. I love that you didn’t skimp on the hardware. I’m doing my first project (two small shelves) and appreciate the inspiration. Thank you. Thank you so much! Good luck with your first project!! You should easily be able to do it all with one can of white then another of blue!